“In defense of Coalition and partner forces, the Coalition conducted strikes against attacking forces to repel the act of aggression against partners engaged in the Global Coalition’s defeat-Daesh (Islamic State, IS, formerly ISIS/ISIL) mission,” the Central Command said in a press release. The retaliatory attack was carried out after Syrian “pro-regime forces initiated an unprovoked attack against well-established Syrian Democratic Forces headquarters,” the coalition claimed. The US-led coalition has also firmly stressed its “non-negotiable right to act in self-defense,” since its service members are embedded with the “partners” on ground in Syria. The confrontation reportedly took place some eight kilometers east of the Euphrates River “deconfliction line.” There were no immediate reports of casualties on either side. Wednesday’s incident is the latest of its kind involving the US-supported rebels and Syrian government forces. Washington remains under the impression that the coalition air force and its “partners” on the ground are allowed to operate east of the Euphrates, while the Syrian forces should remain west of the imaginary demarcation line. 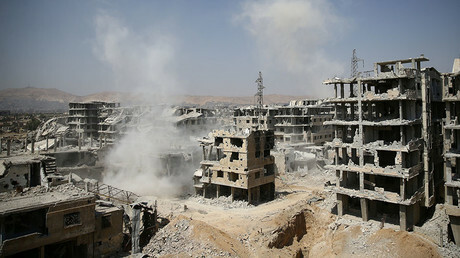 Damascus has repeatedly stated that the US coalition presence on its soil is an act of aggression and a violation of the country’s sovereignty. The Russian and Syrian air forces are the only ones officially allowed to operate in Syria. In fact, the government of Syria has repeatedly asked the United Nations to urge the US to leave, particularly following the virtual defeat of Islamic State terrorist group. However, US Secretary of State Rex Tillerson has instead promised that US troops will remain in Syria indefinitely to counter Syrian President Bashar Assad and Iran’s influence in the region. The US-led coalition also mulled creating a 30,000-strong border force to secure control of the territory held by their partners in Syria. Since the force would include the Kurdish-dominated SDF alliance, the idea triggered a strong backlash from Turkey, forcing Ankara to initiate ‘Operation Olive Branch’ to secure a buffer “safe zone” in Syria.